Let's face it. The Yellow Pages are dead. If you want your phone to ring, it's time to turn to the internet. How long will it take to start receiving leads? 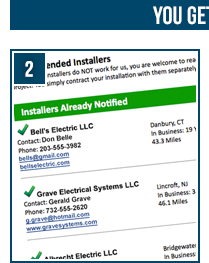 How many installers' names are you giving each customer? Do I have to take the job if I don't want it? 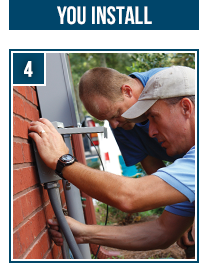 Which brands of home standby generators do you sell? Which brands of pumps do you sell? Can I select which brands I install? Will you send me leads for Maintenance or Service? How do I update my account or the information I input in my application? 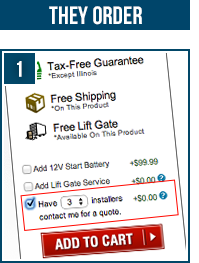 What if I have questions about the program or problems once I am a preferred installer? Fill out an application, it's that easy! 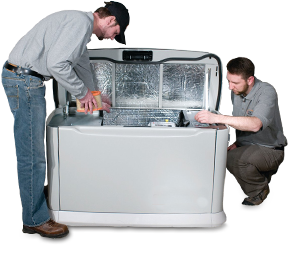 Your application will be sent to our installer group for approval and you will be added to our list right away. This whole process only takes a few days. As soon as a customer in your area orders a product from us, we will send them your info. Depending on your area, it could be the same day! It's completely free to sign up. The leads are also free. The only thing you need to do is respond to quote requests from customers! Fill out the application and then quote jobs, that's it! This will depend on your location and the number of competitors in your area. Most customers will receive 3 contact names. You only need to quote the job if you are interested, but in order to ensure you continue to receive leads you will need to at least contact the customer or PED and let us know you are not going to quote the job. Currently, we sell Briggs & Stratton, Cummins Onan, Electro Industries, Generac, Kohler, Modine, Mr. Heater, Panasonic Heating and Cooling, QuietCool, Reznor and Winco. Currently, we sell A.O. Smith, Basement Watchdog, Bosch Thermotechnology, Buderus, Burcam, Ecostyle, Flint & Walling, FloTec, Franklin Electric, Grundfos, iON Products, Liberty Pumps, Little Giant, New Yorker, NexPump, PHCC Pro Series, ProFlo, Red Lion, Rheem, Rinnai, Schluter, Simer, StormPro, SUMPRO, Superior Pump, Taco, Wayne, Weil-McLain, Williamson-Thermoflo and Zoeller. Yes, we will designate your account with the brands you install and only send your contact information to customers purchasing that brand. 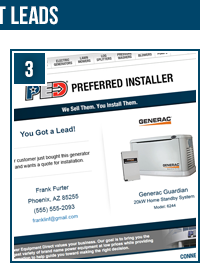 Once you sign up for this program, you will be considered a PED preferred installer and if you have included service and maintenance as a specialty, we will send you those leads. Once you sign up, you can log in with your e-mail address and the password you entered. If you forgot your e-mail address or password, click here. Please contact Annette at 866-437-7998. She is our dedicated resource to the Preferred Installer program. © Power Equipment Direct, Inc. All Rights Reserved.